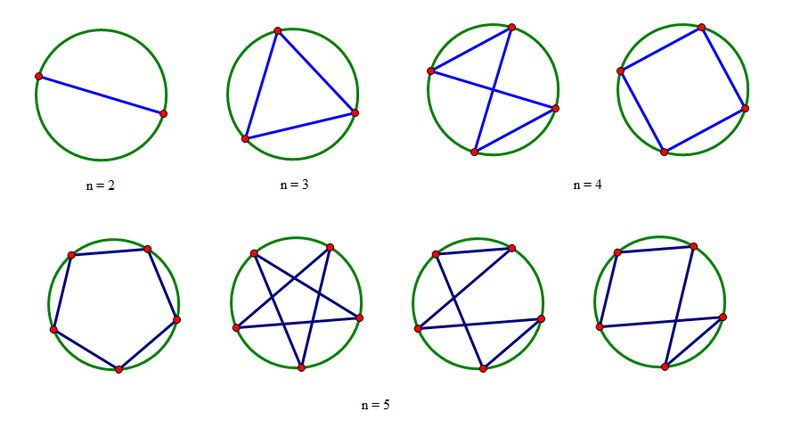 Take $n$ equally spaced points on a circle. Connect them by a cycle(circuit) with $n$ line segments. Two cycles are considered equivalent if same when rotated or reflected. How many cycles are there? It can also be viewed as integer sequence. Not the answer you're looking for? Browse other questions tagged sequences-and-series combinatorics geometry combinatorial-geometry or ask your own question. If $a_n$ and $b_n$ are equivalent sequences and $a_n$ is bounded then so is $b_n$. Proof Verification: Regarding equivalent sequences and Cauchy sequences, Tao Analysis I: Exercise 5.2.1. How many $n$-pointed stars are there?